These shawls and scarves are handwoven from 100% Alpaca wool. The alpaca is a llama looking beast that has some super-soft wool type fur, and these show it off in all its glory. Absolutely gorgeous. Just as soft as can be, not scratchy like regular sheep wool. A natural creamy white, it can be dyed with our Dharma Acid Dye to any shade you desire. Just remember to treat these like wool when dyeing - if you throw them into a washing machine, you will get maximum shrinkage, felting, and very tangled fringe! This is also another fair trade product from Bolivia, so the Bolivians get almost every penny of every purchase. Considering what handwoven wool shawls and scarves go for these days, ESPECIALLY ALPACA!, these prices are honestly an absolute steal. Please note that these are handwoven, one at a time, by human hands, working on a non-mechanized loom. No two of these will be exactly alike. Slubs and other variations in the weave and texture are to be expected and are not considered flaws. Handmade, one-of-a-kind and lovely! In response to requests, we had the size of the shawl increased. 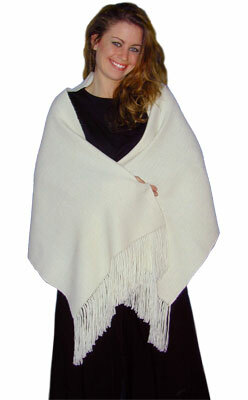 The Bolivian Handwoven Alpaca Shawl is now 24" wide X 72" long with a 5" fringe. It makes for a very luxurious garment. Of course, it also increases the cost, but still a major bargain! NEW for 2018 - Scarves are 14" x 72" with a 5" fringe. Same wildly soft material from the same hard-working people. Be sure to check out the new Bolivian Knitted Alpaca Infinity Scarf as well! I love alpaca and own a lot of it but this was the first time I dyed it myself. I treated it in a cavalier fashion as far as washing goes and it did felt up some and the fringe looks like dreadlocks (sp?) --but it is stunning in this incarnation! I fan folded it longwise then rolled it into a cinnamon bun shape and crammed it in my smaller dye pot then tossed in all my "sunset" colors--golds yellows and a touch of orange. It took the color in a very subtly graduated way maybe because the natural color is darker than my usual silk? The felted texture is bumpy and nubbly but still soft and it is truly an art-to-wear piece. I'll order another of these in the future probably even if this one doesn't sell! Soft drapey warm. Everything I had hoped it would be. The natural color is beautiful am thinking about not dying it at all! Warm & cuddly. The weave is looser than I'd like. Soft warm and snuggly. Love it. Takes a lot of dye but then the result is just beautiful. Will be making more of these. i find it the right size - not too big not too small. I purchased a shawl several years ago. It is just wide enough to cover my body. When it is especially cold I put it under my wool blanket which is under a down comforter and I am toasty warm. My sister also has one in Maine and she truly enjoys it. Have ordered previously and they are wonderful. Beautiful. I am preparing to dye them and will let you know when that is accomplished.